Finn’s personal experience of the upward spiral in his own life compelled him to want to bring the upward spiral to others. This desire to spread the joy resulted in the Blissology Project. Finn explains that Blissology is “the art of tuning into something big; the experience of love.” The Blissology DVD is part of the greater mission of the Blissology Project in general and is a whole lifestyle program, not just a simple yoga DVD. Finn wrote a Blissology Project E-Book as a companion to the DVD. 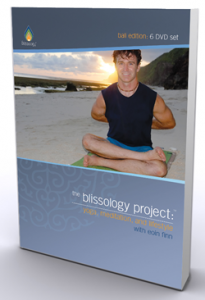 In the book, Finn describes his life mission, defines blissology, expands on his vision for the project, and outlines the bliss commitments, providing instruction for keeping the commitments through journaling and other means. Finn’s philosophy infuses the entire booklet. The essence of the Blissology Project is to have people adhere to five Blissology Commitments over a four-week period in order to establish habits that will take them into an upward spiral. The five commitments involve yoga, meditation, nature appreciation, food awareness and gratitude. There is also a “wild card” that changes weekly and users can access from the Blissology website. The first commitment is to daily yoga, whether you follow the yoga sessions on the DVD or attend classes at a yoga studio. Yoga studios around the globe are signing up to participate in the program, to make it easier for people to stick to their commitments. The yoga sessions on the DVD range from 27 to 55 minutes in length. There are 12 different yoga routines incorporating a variety of themes, with adaptations for beginner, intermediate, and advanced levels. The DVD was filmed on location in Bali and that alone is worth the price of the DVD. The combination of setting, music, instructors, and instruction make up a series of yoga sessions that are a pleasure to do each day. I find myself looking forward to doing the exercises rather than engaging in procrastination and avoidance tactics. I own other yoga DVDs, most of which are very good. But none of them has given me this sense of fun and joy that I get from doing the blissology routines. The second commitment is to daily meditation. Six ten-minute meditations are included in the DVD. The meditations help you to centre and relax, as well as to settle your mind chatter. The one thing I found difficult at first was to keep my eyes closed through the meditation and shut everything out, including the beautiful scenes from Bali shown on the DVD. My solution was to go through each meditation once with my eyes open just to take it all in. The Bali setting is a constant reminder that nature appreciation is part of the commitments, and I find that when I do either the yoga or a meditation, I take stock of my own surroundings and find something in nature to notice and appreciate. Winter is always a difficult season for me, as I dislike the cold. But I have noticed that since making a concerted effort to appreciate what is around me, I’ve been able to not only look out the window and find the beauty in the snow-covered world outside but also to actually go out into it and connect with it more fully. Participating in the program has allowed me to see winter from more than one perspective and it is nourishing to the soul. Finn recommends educating yourself about yoga in order to practice it safely. Go to a yoga studio and have some sessions from a qualified instructor who can teach you correct form and technique. The yoga on the DVDs is composed of a series of flows or Vinyasas, and if you study and learn the poses with the help of the instructional videos, then you can better follow the choreography of the yoga flows on the Blissology DVD. While you would get better with practice just by doing the DVDs regularly, the instructional videos help you to get there that much faster, and the reward is that you feel powerful, confident, and graceful as you move through the flows. Finn’s Blissology Project is a unique methodology for creating that upward spiral in your life, and the Blissology Project DVD is a valuable aid to help you meet your bliss commitments. Regardless of where you are in your physical, mental, emotional and spiritual journey, committing to the Blissology Project will help elevate you to the next level. The result is a greater feeling of connectedness, appreciation, awareness and physical power.